I’m definitely feeling those lazy days of summer so I’m turning to my crockpot for some tasty and easy summertime cookin’ ! 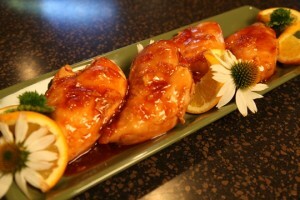 This Crockpot Orange Chicken recipe is to die for! I’m so glad I discovered this new technique for cooking chicken in the crockpot! The secret of this recipe is to cook the chicken breasts on high for 3 hours and then DRAIN the juices off of the chicken before you add the sauce. Then, the chicken only has to cook another 30 minutes slathered in the sauce. This sauce is full of sticky and tangy goodness that will tantalize your taste buds! So give this recipe a try and let the crockpot do all of the work for you. 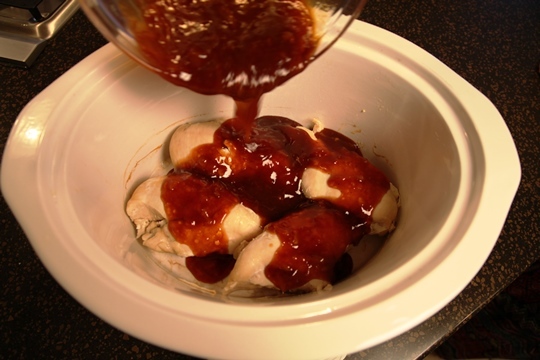 The sauce on this Crockpot Orange Chicken recipe is full of sticky and tangy goodness! You'll want to serve extra sauce on the side for dipping! Place the chicken breasts into the crockpot. Cover and cook on HIGH for 3 hours. 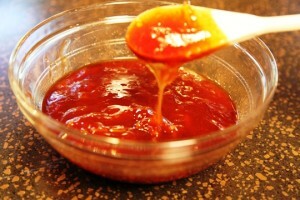 Mix the orange marmalade, BBQ Sauce and Soy sauce together and pour over the cooked chicken. Pour the sauce over the chicken in the crockpot. Cover and cook on high another 30 minutes. Spray the crockpot with Pam. 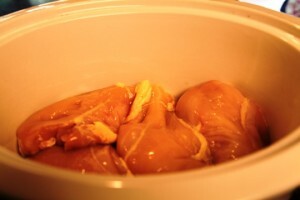 Place the chicken breasts into the crockpot. Cover and cook on HIGH for 3 hours. Pour the sauce over the chicken breasts. Cover and cook on HIGH 30 more minutes. 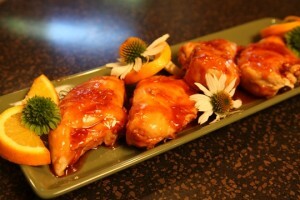 While the chicken is cooking in the sauce, you might want to think about some garnishes for the dish! 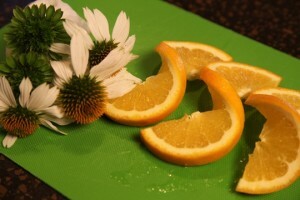 My flower garden is in full bloom so I clipped some “food safe” flowers to add to my orange swirls. You may also want to check out my Success Secrets Flower Garnishes. Now that has to be one of the easiest recipes we have done! Be sure to serve some of the extra sauce on the side so everyone can dip every bite into this yummy sauce. My family devoured this delicious and easy meal. My husband, who hates anything remotely resembling Chinese food, even commented that if all Chinese food tasted like this he would eat it all the time! I am so glad your family liked it! I really love this recipe and I love being able to cook it in the crock pot!